Congratulations to district Conservation Farmers of the Year, Michael and Carolyn Edwards. Michael and Carolyn Edwards own the 42 acre Four Oaks and Forge Farm in southwest Kanawha County off of Smith Creek Road. Michael began working with the Capitol Conservation District and the Natural Resources Conservation Service in 2013 with the development of a Conservation Plan. Through that plan, he has taken advantage of several programs through both agencies to improve pastures through grazing management, application of lime and fertilizer, and frost seeding. He has also installed divisional fences and additional water sources to facilitate rotational grazing. Michael improved water quality on his farm by installing gutters on his barn to direct water away from feeding areas and excluding livestock from the pond and wetland on his property. In 2015, their farm was awarded WV Century Farm status through the WV Association of Conservation Districts. The Edwards’ farm is one third of the 110 acre Alford Farm owned and operated by Carolyn’s family for over 100 years. Michael continues to regularly test soil, apply nutrients, and rotational graze patures to maintain a high level of conservation on his farm. Michael is an excellent steward of the land and has done an excellent job of bringing his property back into a working farm. 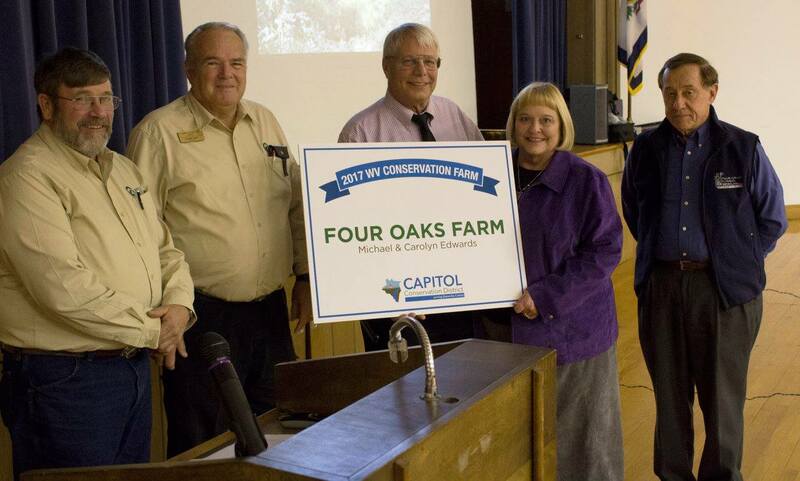 For those efforts, we are honoring Michael and Carolyn Edwards’ farm as the 2017 Capitol Conservation District Conservation Farm.